Our holiday house Can Jenny with spectacular sea view is situated in a private villa development – Santa María de Llorell – on an enclosed property. 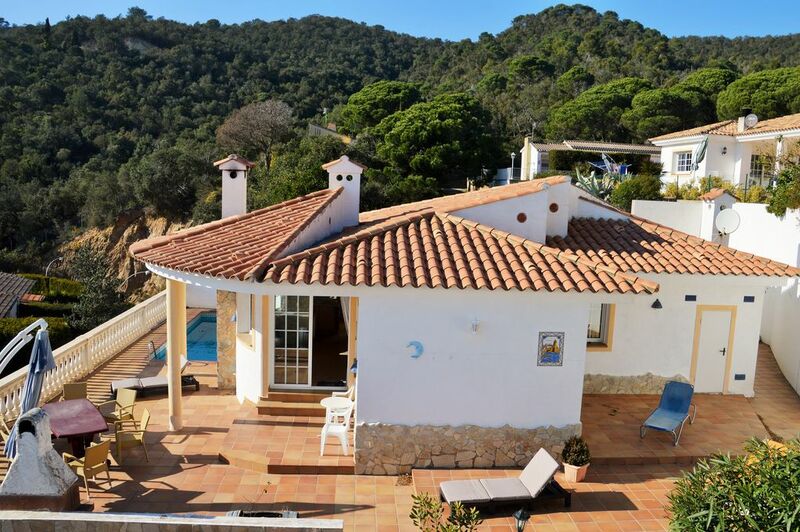 It’s about 3km to Tossa de Mar and 1400m to the private beach. The complex benefits from a 24 hour-surveillance by our own security service. Tossa is said to be one of the loveliest towns of the whole Costa Brava. Lloret offers, apart from all water sports, go-karting and swimming, a varied nightlife. Next to the entrance to the private villa complex Santa Maria de Llorell/Tossa de Mar, you will find a supermarket, two reasonably priced restaurants and three tennis courts with showers. Girona airport: Girona airport is 35km away. There are Ryanair flights available from Frankfurt-Hahn airport (free parking) from €0,99 + taxes. We are very satisfied by Ryanair. Excellent service and totally new airplanes. Our flight from Hahn to Girona in a Boeing 737-800 took 1.35 hours. Cars are available for rent in Girona. Living space 110m², sea view, very well maintained equipment, gas central heating, large living room with fireplace. Interior furnishings with a solid wood dining table from Mexico. 82cm-flatscreen to watch those World Cup matches. I booked Can Jenny just for it's location and the description on this web site. We needed the location as my son was playing in the MIC football tournament and myself and the rest of the family wanted to go and watch the games, in between holidaying, which were all within 40 minutes of the villa. I have to say that we were more than pleasantly surprised. The villa itself is in a fantastic setting, about half way down the hill and with a sea view. It's clean and tidy and all on one level and has a lovely pool - although a bit cold in April (it did get used by my brave sons and their friends though). We did not have good weather for the whole week but a pack of cards and a roaring fire in the wood burning stove at least partly made up for the lack of sun. The villa is situated on a private and secured estate with many, very nice, villas all around it and, at the bottom of the hill, is a very nice private beach for the residents and a very welcoming beach bar. Turn left out of the estate and you head to Lloret de Mar (where my footballing son was staying). It's a typical Spanish resort full of tacky night life and Northern Europeans in inappropriate clothing - if you like that sort of thing! Turn right out of the estate and you will quickly come to Tossa de Mar which is a real treat with Riviera style architecture, a beautiful old castle, lovely beach and fine restaurants - a real contrast! Carry on up the coast road (and what a road!) and your breath will be taken away by the scenery and you will eventually reach the beautiful town of Sant Feliu de Guíxols. Two reasons for giving 4 stars instead of 5. Firstly the weather and secondly, because of the weather, we couldn't get our clothes dry - the villa could really do with a tumble dryer. I hadn't been to this part of Spain before but I have fallen in love and will definitely go again and I would definitely go back to Can Jenny - what a find! Tolles großzügiges Haus mit schönem Pool. Es hat an nichts gefehlt. Wir waren mit zwei Hunden dort eine Woche im Urlaub und waren begeistert. Das Haus ist groß und sauber. Sehr ruhige Lage und der Privatstrand war einfach toll. Auch die Lage zwischen Lloret de Mar und Tossa de Mar hat große Vorteile. Beide Orte sind mit ihren Sehenswürdigkeiten und guten Restaurants schnell zu erreichen. Wir hatten auch Glück mit dem Wetter. Also alles in allem war es ein toller Urlaub und wir kommen wieder. Lotissement privé très sécurisé.Le descriptif initial est respecté à la lettre,tout est parfait. De plus le propriétaire est très aimable et respecte ses engagements. La ville de Tossa est très proche est offre toutes les commodités. Sehr schönes Haus mit toller Terasse (wie auf dem Bild zu sehen). Wir haben es genossen. Holiday home Can Jenny is located at one of the most beautiful stretches of the Spanish coastline, between Lloret de Mar (6km) and Tossa de Mar (3km). Tossa is said to be one of the loveliest towns of the whole Costa Brava. Lloret offers, apart from all water sports, go-karting and swimming, a varied nightlife.